College search ‘101’ in the era of BDS: Where can a Jewish student feel safe? (JNS) Is anyone truly prepared for the meat grinder that is the college selection process? It’s all-consuming, sucking the entire family into its vortex: which schools to apply to, the endless tours and interviews, the essays, references and financial-aid applications, followed by months of nail-biting. A decade ago, after slogging through the process, if your child was accepted into a selective college, you’d breathe a sigh of relief, cash in your investments and have something to crow about when you run into your neighbor at the supermarket. But that was before anti-Israel fever reared its ugly head on many North American campuses, as wildly popular today as was goldfish-swallowing in the 1950s, and draft-card (and bra) burning in the 1960s and ’70s. Coming to the rescue of concerned and confused parents is Jerome Ostrov’s Finding the Right School in the Era of BDS and Intersectionality: A Jewish Parents’ Guide to Colleges: 2018-19 Academic Year. The hefty tome (444 pages) demystifies for parents much about the college selection process (for those clueless about what differentiates early and rolling admissions for example), but first and foremost, it’s an invaluable guide to protecting your child from the anti-Israel and, increasingly antisemitic, forces eating away at the fabric of many North American universities. In these pages, the author, a retired lawyer who’s done his homework over the years studying America’s colleges and universities (and visiting 125 of them in the process), introduces parents to the BDS (Boycott, Divestment and Sanctions) movement. Long story short: In the last three years, 56 resolutions have been introduced into student governments recommending their schools withdraw from any business or academic relationship with Israeli companies, universities, hospitals, research projects, etc. (At some schools, even a brand of hummus served in dining halls with the Israeli name Sabra has triggered protests.) More than half of these BDS resolutions have passed, and new ones are introduced each month. Colleges that have passed such resolutions include Columbia University/Barnard College (which tops many a “Worst Schools for Jewish Students” list); Tufts University; the University of Massachusetts in Amherst; no fewer than five University of California campuses; George Washington, New York and Northeastern universities; and such heartland institutions as the Ohio State University, and the universities of Michigan, Minnesota and Wisconsin. Ostrov also launches into a comprehensive and clear explanation of intersectionality, a phenomenon that pulls all manner of minorities, including Hispanics, African-Americans, gays and lesbians (and in some schools, even poets) into a single category of minority identity. Once unified, they become convinced by anti-Israel forces that Israel is an all-powerful oppressor, and as such, represents the common enemy of oppressed minorities. On contemporary campuses, as pro-Palestinian activists from organizations such as Students for Justice in Palestine (SJP) campaign against Israel as an “oppressor,” Ostrov points out that increasingly on the chopping block are no longer just the “settlements,” but Israel’s very right to exist. The author makes no bones about the name of the anti-Israel game on many campuses: Its goal is to demonize Israel and chop away at Jewish (and non-Jewish) students’ support for and identification with the Jewish state. Indeed, hostilities typically surface at shout-downs of speakers from or about Israel and shut-downs of Israel solidarity events, with the conflict often peaking during the ubiquitous “Israeli Apartheid week” on many campuses each spring, where Israel is publicly blamed for any and all tensions in the Middle East. This calls on Jewish parents to scrutinize each college for more than just its selectivity, graduate-school acceptance rate, financial-aid package, Greek life or even sports teams. To help Jewish families do just that, Ostrov’s guidebook proceeds to deliver a balanced and honest assessment of 126 of the American colleges and universities most popular with Jewish students. In these listings, the Guide provides an overview of each school’s academic environment, strongest departments, campus layout and a list of comparable schools. But even more timely given the anti-Israel tension on so many campuses is key information not to be found on a school’s website or in its admissions brochures. Each college’s profile includes the level of anti-Israel activity on campus, including BDS campaigns and the school’s rankings in the Forward’s “Best Colleges for Jewish Students” and in the Algemeiner’s “Worst Colleges for Jewish Students.” Included as well are campus Jewish resources (such as Chabad on Campus Houses and Hillel centers, kosher food availability, and Shabbat and holiday services) and what percentage of each student body is Jewish. Major Jewish donors are an interesting feature (though more telling may have been the major Muslim donors). And not content with listing rankings, percentages and Jewish resources, Ostrov has thoroughly researched recent incidents on each campus, painting an honest (though not alarmist) portrait of each campus environment. These detailed descriptions provide the reader with a sense for the atmosphere a Jewish student might encounter (and, even after barely one semester, there are already quite a few anti-Israel actions that may just be included in next year’s Guide). Small quibble: When reporting the number of endowed chairs on a campus, Ostrov fails to mention whom they are endowed by. 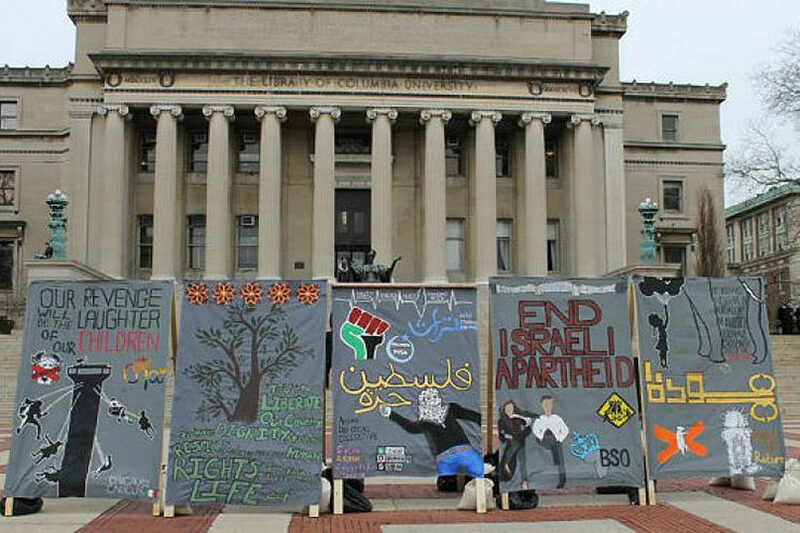 It matters: Just ask the kids listening to anti-Israel professors at Columbia, NYU and other schools where Arabs and their friends foot the bill for endowed chairs, meaning millions of dollars dropped into a school’s coffers. Another nit-pick: When reading a school’s ranking in the “Best” or “Worst” lists of colleges for Jewish students, it would be helpful to know that a school ranked, say 12th out of how many, so readers can quickly see where it stands against the field studied. But these are tiny gnats in an otherwise lush garden filled with the kind of important analyses, comparisons and sage advice not readily found elsewhere. With so much at stake – whether your son or daughter spends four of their formative years in an environment that scorns their people’s homeland and, all too often, the Jewish people themselves – isn’t it worth spending the time to discover what these campuses have become, and have a heart-to-heart talk with your college-bound child about Jewish and family’s values and loyalties? Bonus: The Guide’s Appendix provides a short, but insightful and easy-to-read, backgrounder on Israel. If every incoming Jewish college student had a copy of it in their backpack, they’d find themselves grounded in both the complexities of the situation and what’s at stake, as well as empowered to respond confidently to potential hostility. Of course, neither the most well-meaning parent nor Ostrov himself can guarantee a student won’t ever face attacks about the Jewish homeland and the Jewish people – be they subtle or overt – which is especially upsetting when young adults are away from home for the first time. But if it’s important to you that your children are in a place where open dialogue is encouraged and where they are able to express positive thoughts and feelings about the one Jewish state on the planet, then this Guide can help them spend the next four years of their life in a more supportive and open environment.